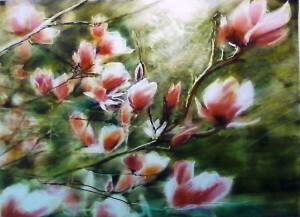 "Magnolia tree near our house" by Caroline Mustard. Photo by Tara Iyer. 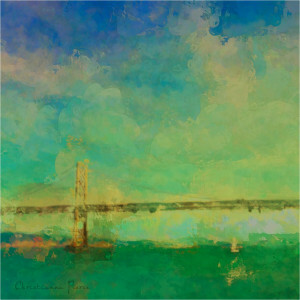 “Bay Bridge Sailboat” by Christianna Pierc 2013. Courtesy of Pacific Art League. Photo by Tara Iyer. Walking into the Pacific Art League’s July 12 exhibition, you might never have guessed that much of the artwork on display wasn’t created with an easel and a paintbrush but instead took form on digital platforms, the work of artists who’d traded in their oil paints and charcoal pencils for more modern tablets and styluses. Friday’s exhibition was advertised as one of the first in the world to feature art from mobile digital platforms. Using inexpensive apps such as Sketchbook Pro, Procreate and Paper, the artists achieved an unbelievable range of artistic styles, mimicking pencil sketches, oil paintings, and watercolors so well it was hard to distinguish the digital artwork from more traditional pieces. that although he doodled as a child, it wasn’t until he got his first iPad in 2011 that he found the perfect platform for him to pursue his passion. His stunning artwork on the iPad has since led to him being featured at Macworld 2012 and 2013. However, the best part about creating art through tablets, according to Vishwakarma, is the inexpensive and easily accessible nature of apps. Vishwakarma’s colleague Caroline Mustard noted that although digital art platforms have been available for many decades – she recalled going to a computer art exhibit in 1968 – they were previously too expensive for many artists to use. “Magnolia tree near our house” by Caroline Mustard. Photo by Tara Iyer. For those without access to traditional art training, mobile digital art can open up a whole new world of possibilities, providing almost the same variety of colors and techniques as traditional art at a fraction of the price. As shown by the exhibition, moreover, digital artists can work almost anywhere – one artist, Raheem Nelson, composed some quick sketches on his iPad while simply roaming around the gallery. 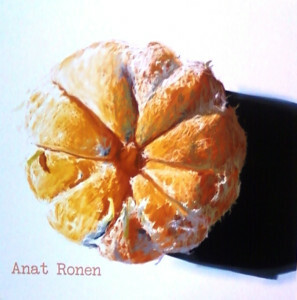 “Orange Slice” by Anat Ronen. Photo by Tara Iyer. Ultimately, the gap between digital and physical artwork has continued to narrow. The vibrancy of the colors, shades, and textures portrayed by the pieces on display was so intense that they looked every bit as convincing as paint-on-canvas pictures and true sketches. I found myself utterly captivated by the realism captured by many of the pieces, from self-portraits reminiscent of oil paintings to flames that literally licked the side of their canvas. Overall, the exhibit, which opened July 12, proved that mobile digital art is truly beginning to change the face of the modern art world. And the best part? Anyone and everyone can do it.